« Globalisation and whose recovery? After signs of slightly better economic data in the last month; and relief that China had not had a meltdown, the Fed’s July meeting talked of an improving situation that might merit a hike in its policy rate by the year-end. But if the preliminary figures out today for US real GDP growth are anything to go by, then even that may not materialise. The US economy grew far less than expected in the second quarter. GDP increased at only a 1.2% yoy rate. Growth is being driven by consumer spending, which increased at a 4.2% rate – the fastest since the fourth quarter of 2014. That in turn is driven by cheap borrowing and rising house prices. 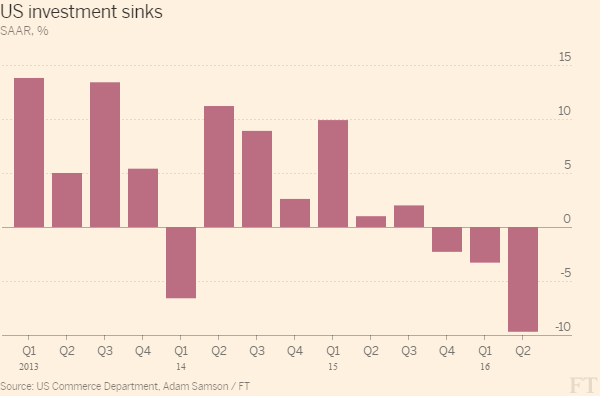 But business investment continued to plunge, down at a 9.7% annual rate, the third straight quarterly fall. Indeed, outside the US, things may have not reached meltdown, but the major economies continue to stagnate. 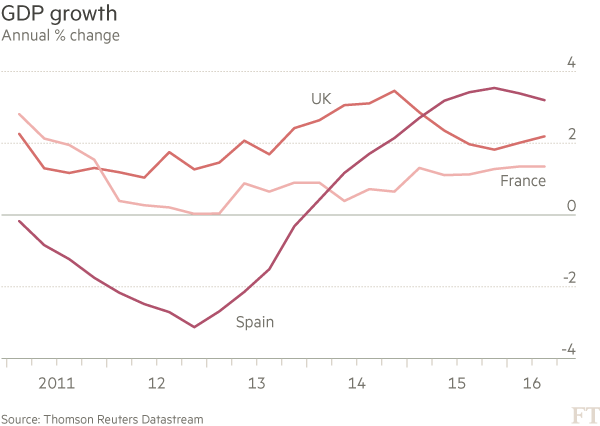 One the fastest growing economies in Europe in the last year is Spain, but second quarter figures showed a slowdown in real GDP growth to 3.2% from 3.4%. And Sweden also slipped back from 4.2% yoy in Q1 to 3.1% in Q2, with the slowest quarterly growth rate in three years. Austria’s growth rate also slowed to 1.2% yoy. Only the UK has seen a pick-up to 2.2% in Q2 to 2.0% in Q1 (but expect that to be revised down after the investment data comes in) – and the impact of Brexit has yet to be calculated. France stagnated in Q2. Overall, growth in the Eurozone cooled in Q2. And the European Commission recently trimmed its growth forecasts for the next two years following the UK referendum. The well-regarded purchasing managers’ index for the eurozone fell to an 18-month low in July. It’s worse in Japan where industrial production and corporate profits are contracting. And of course, China’s growth rate has steadily slowed. Brazil, Russia and South Africa are in recession. So what is to be done? Once again desperate measures are being considered – in particular ‘helicopter money’. I have explained the origins and nature of this flying money before. The theory behind the concept is to fuse monetary and fiscal policies: cash-strapped governments sell short-term debt straight to their central bank for newly printed money that is then injected straight into the economy via tax cuts or spending programs. The usual intermediaries, like banks, are bypassed. Helicopter frenzy has reached a new level with the efforts of the Japanese government to get its economy going. The government has announced a new package of government spending programmes and it wants to finance these from money printed by the Bank of Japan. This is one step further from Japan’s longstanding aim of restoring economic growth and ending deflation through quantitative easing, then backed up by negative interest rates and now ‘helicopter money’. This is part of so-called Abenomics, the three-arrowed policy of the Abe government (monetary easing, fiscal expansion and ‘reform’ of the labour market by increasing participation by women and reducing labour rights). Abenomics has totally failed. But that has not stopped the likes of Keynesian Paul Krugman dropping in on Abe and calling for more easing. Krugman spoke to a special meeting including and introduced by Abe to advise the Japanese government on what to do to get the economy going. More recently, Ben Bernanke, the original promoter of helicopter money and former Fed chair during the global financial crash, was flown into Japan to advise on yet more printing of money. Bernanke in April published on his Brookings blog that, while there were many challenges behind such a strategy, a “monetary financed fiscal program” shouldn’t be ruled out in the case of an emergency. “Under certain extreme circumstances — sharply deficient aggregate demand, exhausted monetary policy, and unwillingness of the legislature to use debt-financed fiscal policies — such programs may be the best available alternative. It would be premature to rule them out,” Bernanke wrote. As I have noted before, back in the depth of the Great Depression, Keynes came to a similar conclusion that quantitative easing would not work in getting economies out of depression. Low interest rates and extra liquidity cannot get things going again, if the profitability of investment (what Keynes calls the ‘marginal efficiency of capital’) remained too low. Keynes concluded: “I am now somewhat sceptical of the success of a merely monetary policy directed towards influencing the rate of interest. I expect to see the State, which is in a position to calculate the marginal efficiency of capital-goods on long views and on the basis of the general social advantage, taking an ever greater responsibility for directly organising investment; since it seems likely that the fluctuations in the market estimation of the marginal efficiency of different types of capital, calculated on the principles I have described above, will be too great to be offset by any practicable changes in the rate of interest”. General Theory. And so Keynes moved on to advocating fiscal spending and state intervention to complement or pump-prime failing business investment. Nevertheless, the advocates of ‘helicopter money’ are speaking louder. Now the chief economist at the OECD has lent her support to the sound of rotors in the economic sky. Catherine Mann commented on Bloomberg TV that “We can’t just stick with this low nominal GDP growth”. So we need action. “Helicopter money by itself isn’t going to be any more effective at gaining economic growth than what the central banks have been doing already”. Why? Because “you’re just going to take the helicopter money and put it in your mattress — where you’ve been keeping the rest of it.” So, instead, the authorities could opt for helicopter shopping coupons “where you actually have to go spend the money.” Now shopping coupons are going to get capitalism out of depression. It seems that all these mainstream economists do not take into account their own research on the efficacy of quantitative easing. The IMF held a special conference on just that subject last year. And what did they conclude? One economist from the LSE commenting on QE found that: “Yet, there is little evidence that the program led to an increase in credit.” Some Fed economists considered the macroeconomic effect of QE. They concluded that“ our analysis suggests that the net stimulus to real activity and inflation was limited by the gradual nature of the changes in policy expectations and term premium effects, as well as by a persistent belief on the part of the public that the pace of recovery would be much faster than proved to be the case.” Then some European economists looked at the impact of the ECB’s QE. They found that QE“significantly reduced bank risk and allowed banks to access market based financing again. The increase in bank health translated into an increased loan supply to the corporate sector, especially to low-quality borrowers. These firms use the cash inflow from new bank loans to build up cash reserves, but show no significant increase in real activity, that is, no increase in employment or investment”. So the modern mainstream economists found the same result that Keynes found in the 1930s. Pumping money and expanding credit does not work in restoring growth because it does not boost investment or employment. It just fuels a stock market and bond boom. Indeed, while the Japanese government wants to start the rotor blades, the governor of the Bank of Japan, Haruhiko Kuroda, announced at today’s BoJ meeting that helicopter money was ‘illegal’ (as it ‘monetised’ government debt) and things in Japan were fine anyway. So two fingers to Bernanke. I’ll return to how fine things are in Japan in a future post. To add to the evidence against the efficacy on monetary measures to end the depressed level of growth, some economists at the Bank of England looked at the impact of finance on growth. “The real question of interest here is if investment is low, is the blockage that is stopping investment taking place due to real economy factors – such as globalisation and secular stagnation – or financial factors – such as a lack of access to finance.” The BoE economists found what others have also found: that small businesses are starved of credit to invest but large businesses have sufficient internal funds and don’t need to borrow, but still won’t invest. The reason businesses are not investing at previous levels is because the profitability of invested capital is relatively low at least compared with the late 1990s. Quantitative easing, negative interest rates and shopping coupons are not going to turn things around if profitability of investment in productive assets is not sufficient. Public investment is the alternative. The level of public investment in every major economy has been slashed in the years of austerity since the global financial crash. The question then becomes; if more public investment is needed, how is it to be paid for and should it complement private investment or replace it altogether? You know my answer to that. This entry was posted on July 29, 2016 at 3:31 pm and is filed under capitalism, economics, Profitability. You can follow any responses to this entry through the RSS 2.0 feed. You can leave a response, or trackback from your own site. Here’s a question for Michael: In your paper “The Long Roots of the Present Crisis”– you show that the rate of surplus value trends pretty flat between 1983-1991, and then rise steadily from 1992-(app) 1998; the falls again; then rises again from 2001 or so to 2006. To what do you attribute the rise in the rates of surplus value during these periods? Sartesian It’s a good question. I have not really analysed why quantitatively. But qualitatively we know that the main reasons for a rising rate of surplus value are: more intensity of labour; higher productivity from technology; while holding down real wages and so reducing the share of labour in output; to be achieved by various ‘neo-liberal’ measures of trade union laws, privatisation, outsourcing, globalisation etc. The US data would suggest that the hi-tech, dot.com revolution produced a short burst in labour productivity growth in the 1990s, while neo-liberal policies held down the share going to labour. That petered out at the end of the 1990s with dot.com bust and the subsequent mild recession of 2001. Then we had a new burst in profits (probably mostly fictitious) in the credit boom 2002-06, before the profitability and profits downturn prior to the global financial crash. What do you think? Back in the day when I thought I understood Marx, Capital, and US capital, I would have argued something similar. Speaking only about the US: 1993-2000, application of new technologies to production bringing down costs, and time, of production AND circulation ending in…overproduction (97% of the fiber optic cable installed in the US in this period was “dark”– unused). 2001-2003, recession, driving wages down from their 2000 highs (when wages reached a post 1973 high, but not higher than 1973) AND draconian restrictions on capital spending which led to a real reduction in fixed assets, as measured by net property, plant, and equipment. 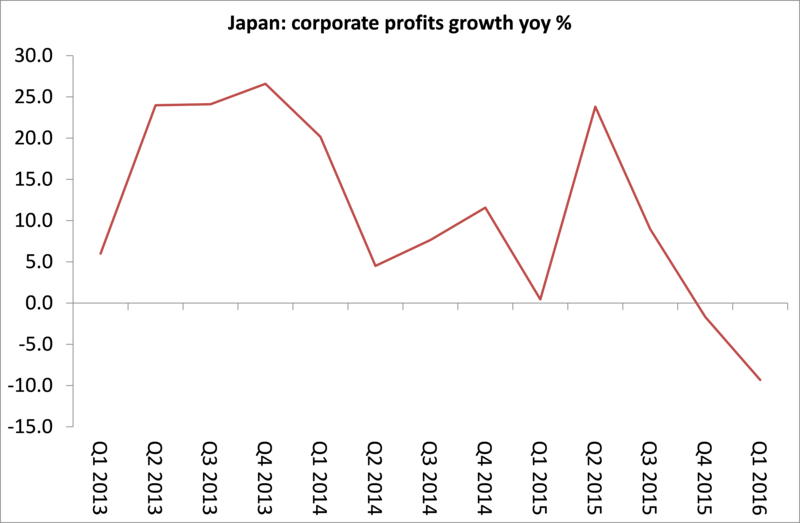 Capital investment resumed in the 2005-2006 period….and we know what happened next. That’s the “skeleton” of the explanation, on which we would hang A) the collapse of the former Soviet Union B) importation of cheap labor C) FDI D) Oil price movements E) Invasion of Iraq F) Asset Backed Securities, etc. etc. Am I hallucinating or is Koo pratically advocating for socialism? As I interpret it, “long-term patient capital” is an euphemism for socialization of wealth, since it requires a “way out of the private sector’s surplus savings problem productively and responsibly”, which means “committing capital to multi-generationally wealth-inducing projects that the private sector is unlikely to want to fund”. The only thing he didn’t say was how this would be funded. Yes, folks, if you answered “expropriation of private property/wealth” (the “private sector”), you answered correctly.